Crafty Carving creates unusual and bespoke items for the home and garden, whether it's for a special occasion or a unique gift for family or friends, Crafty Carving can offer the perfect solution by creating name plates, picture/certificate frames inscribed with your own personal message. All our timber comes from reclaimed sources, trees that are storm damaged and have been felled because they are unsafe. Each item is made to order so please allow at least 10 days for bespoke work to be dispatched. A humorous carved trivet for placing hot pans and dishes on. Measuring 300x230x40mm It's beautifully deep carved typography will make everybody want to read it, and will certainly get the message across! A stylised gold christmas tree intricately v-carved in oak. This version (no inscription) measures 220x220x35mm. 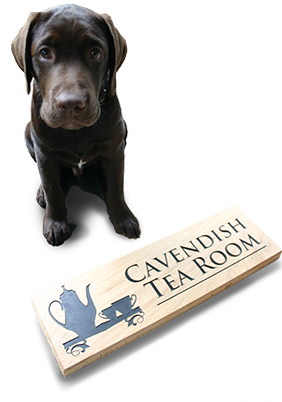 We can customise the design to include inscriptions around the edge or on the face. Please contact us on the form below for us to quote for this. Digital scanning meets a lump of oak! A high tech oak gift when scanned with a modern phone or tablet with a free QR reader application will reveal a short message. This one reveals "I love you" however we can router any short QR coded message. This version (I love you) measures 320x320x40mm. Please contact us with any bespoke requirements. The perfect gift for a loved one. 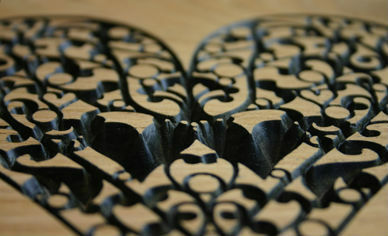 Intricately v-carved in oak. This version (heart only) measures 220x220x35mm. 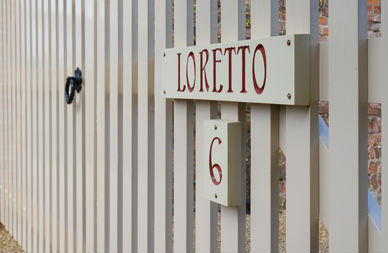 We can however customise the design to include inscriptions around the edge or on the face. Alternative weather forecasting for the garden. Carved on a solid block of oak measuring 260x185x30mm. A humorous addition to any garden. Includes a cast stone and chain. This is a small selection of the signs we have manufactured recently. We are able to carve and paint the inscription to your specification making all our work totally bespoke. Please refer to our separate page on the sign making options. Apparently if you tunnel directly down 7905 miles from the UK through the center of the earth, you would get pretty close to New Zealand. 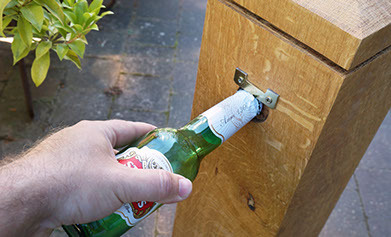 If this information is just too much to comprehend, the rear of the post has a carved beer bottle opener, thus allowing the user perfect deliberation over this amazing fact. Please drink responsibly. Carved on a solid block of oak measuring approx. 140x140x610mm.